An affordable and durable, all-in-one packaged home comfort system that cools or heats with an electric heat pump and switches to gas heat when the mercury dips. Throughout winter, it chooses between the two to utilize the most cost-efficient energy source and save you money. 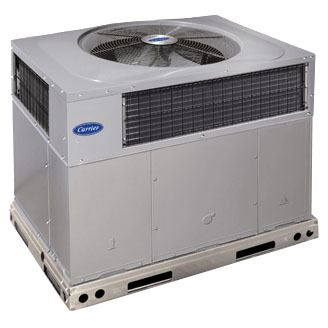 1 Quietest size within each model group during most common cooling operation condition. 3 To the original owner, when product is used in an owner-occupied residence, a 20-year heat exchanger parts limited warranty upon timely registration of your new equipment. Warranty period is 15-years on heat exchanger if not registered within 90 days. Jurisdictions where warranty benefits cannot be conditioned on registration will automatically receive the extended registered heat exchanger parts limited warranty period. See warranty certificate for details. 4 To the original owner, when product is used in an owner-occupied residence, a Lifetime heat exchanger parts limited warranty upon timely registration of your new equipment. Warranty period is 20-years on heat exchanger if not registered within 90 days. Jurisdictions where warranty benefits cannot be conditioned on registration will automatically receive the extended registered heat exchanger parts limited warranty period. See warranty certificate for details. 5 Ask your Carrier® dealer for details.